FAYETTEVILLE, Ark. – Five individuals and three organizations were honored at the fifth Silas Hunt Legacy Awards Celebration on Nov. 9 at the Fayetteville Town Center. The event, which was hosted by the University of Arkansas, recognized the significant impact made by each honoree on the campus, state of Arkansas, the nation and the world. Silas Hunt was a native of Texarkana and veteran of World War II. He became the first African-American student to attend a major public university in the South when he was admitted to the University of Arkansas School of Law on Feb. 2, 1948. Hunt completed his undergraduate degree at Arkansas Agricultural, Mechanical and Normal College, now the University of Arkansas at Pine Bluff. He died of tuberculosis in the spring of 1949 before finishing his law degree. The Silas Hunt Legacy Celebration was created by the university in 2005 and first awarded in 2006. Sponsors for the 2018 event included Con-Real, Arvest Bank, the College of Education and Health Professions, the College of Engineering, the Sam M. Walton College of Business, the Fay Jones School of Architecture and Design, Fayetteville Public Schools, the J. William Fulbright College of Arts and Sciences, the School of Law and the John Newman Family. The honorees of this year’s event were chosen by a committee of faculty, staff and student representatives assembled by the Office for Diversity and Inclusion. Joseph W. Daniels, III is pursuing his doctorate in civil engineering at the University of Arkansas and conducts research on heated pavement systems with a focus on airfield pavements. He earned a Bachelor of Science in Civil Engineering from North Carolina A&T State University. At the U of A, Daniels served two terms as president of the Black Graduate Student Association and hosted the “Tapestry: Courageous Conversations about Race” event. He also assisted with a conference to recruit top African-American students for U of A graduate programs. Daniels has served on the Graduate Dean Student Advisory Board, assisted with graduate school recruitment and serves on the All-University Academic Integrity Board. He was awarded the Alex Marino Service Award for his outstanding service to the U of A and Fayetteville community. Daniels has been awarded the Secretary of Transportation’s RAISE Award, the Airport Cooperative Research Program Graduate Research Award and the Dwight D. Eisenhower Transportation Fellowship. He also serves in multiple volunteer capacities in his community. Ebony Oliver Wyatt graduated from the University of Arkansas in 2003 with a B.S.B.A. in finance from the Sam M. Walton College of Business. She is the director of sales for the Walmart team at General Mills and has worked for the company for 15 years. In 2017, she became the first African-American female sales director for General Mills. Wyatt was the recipient of the Walton College’s Outstanding Service Award and the Inclusive Excellence Champion Award from the college’s Office of Diversity. At General Mills she leads two mentor circle groups, is the company’s diversity recruiting lead at the U of A and is the immediate past president of the Black Champions Network at General Mills. She also led the first satellite session of “Courageous Conversations” dialogue on race at General Mills. Wyatt is a member of the Walton College’s Business Alumni Advisory Council and is a past member of the Black Alumni Society Board. She is married to William Wyatt, and they have three children. John L Colbert is a native of Rondo, Arkansas, and graduated as the first African-American valedictorian of Barton High School. He later earned a B.S.E., M.Ed. and Ed.D. from the University of Arkansas. Colbert began his career as the first African-American special education teacher at Bates Elementary in Fayetteville. Eight years later, he was named the principal at Howard Elementary in Fort Smith. Colbert returned to Fayetteville as the first African-American principal in 1987 and oversaw the launch of Holcomb Elementary School. He is currently serving as the first African-American superintendent of the Fayetteville Public School District. 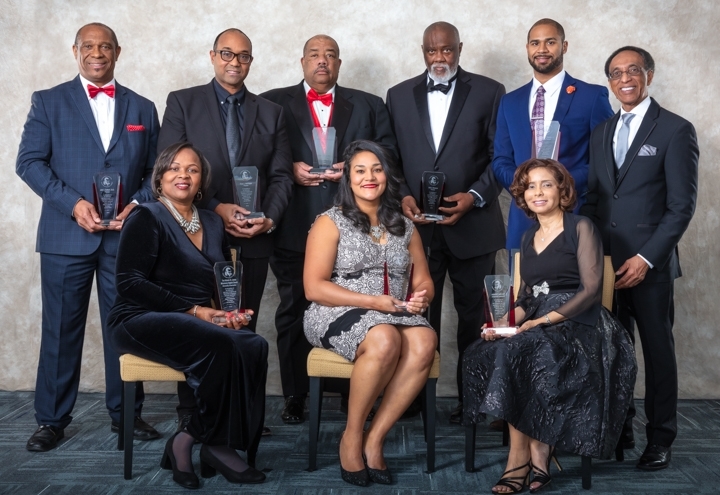 At the U of A, Colbert is a former board member of the Arkansas Alumni Association, officer of the Black Alumni Society and received the Andrew J. Lucas Alumni Service Award and Arkansas Alumni Heart Award. A member of both the Kappa Kappa and Omicron Zeta Lambda chapters of Alpha Phi Alpha Fraternity Inc., Colbert has been inducted into the U of A Greek Hall of Fame. For the past 21 years, he has assisted with the Martin Luther King Jr. Celebration Banquet. Colbert is involved in numerous civic organizations and has received many local and national awards for his involvement in education and the Alpha Phi Alpha Fraternity. Raye J. Montague, who passed away last month, was a retired internationally registered professional engineer who earned a B.S. from the University of Arkansas at Pine Bluff. She began her career in Washington, D.C., with the U.S. Navy in 1956 and retired after more than 33 years of service. She is credited with the rough draft of the first U.S. naval ship design using a computer and was awarded the U.S. Navy’s Meritorious Civilian Service Award in 1972. The same year, she was nominated for the Federal Woman of the Year Award. As the Program Manager of Ships for the U.S. Navy’s Naval Sea Systems Command Information Systems Improvement Program, Montague held the civilian-equivalent rank of captain. She was the first female professional engineer to receive the Society of Manufacturing Engineers Achievement Award and the National Computer Graphics Association Award for the Advancement of Computer Graphics. She was also the first female to serve on the Board of Directors for the Numerical Control Society. Montague was inducted into the Arkansas Black Hall of Fame in 2013. In 2017, she was featured on ABC’s Good Morning America and recognized by the U.S. Navy as their “hidden figure” during naval events in Washington and Dahlgren, Virginia. In 2018, Montague received an Honorary Doctorate Degree from the University of Arkansas at Pine Bluff. Montague’s award was accepted by her son, David Montague of Little Rock. John L Newman grew up in Rohwer, Arkansas, and Kansas City, Kansas. He attended the Columbus College of Art and Design in Columbus, Ohio, and majored in illustration before being drafted into the army in 1970, where he worked as a military policeman. Newman later earned a teaching certification, B.A. and M.F.A. from the University of Kansas. As an artist, he received a post baccalaureate fellowship, the Vermont Studio Fellowship and the Visual Art Fellowship from the National Endowment for the Arts. He also worked as an activity director for a juvenile detention center and spent two years teaching art to prisoners at the Lansing State Penitentiary on a fellowship from the Kansas Arts Commission. He next became an adjunct instructor at Sinclair Community College in Dayton, Ohio, and was invited to the University of Northern Iowa as a visiting professor. Newman joined the University of Arkansas in 1990 as a visiting professor and retired as a tenured associate professor in 2013. Newman served as a board member for numerous organizations in both Arkansas and Kansas, and his artwork has been shown in all 50 states, Jamaica and the Republic of Macedonia. His work is part of the permanent collections of the Nelson-Atkins Museum in Kansas City; Spencer Museum in Lawrence, Kansas; Museum of African-American Life and Culture in Dallas; University of Arkansas Law Center; University of Arkansas in Fayetteville; the Kansas City, Kansas Community College and a number of private collections. The Alley Scholars was created by Troy and Unnice Alley to assist deserving minority students with educational and career goals by providing scholarships, networking and career opportunities. Founded in 2010, the Alley Scholars is supported by the Troy and Unnice Alley Foundation and other organizations. A key component of the Alley Scholars is their program that develops the best and brightest minority students into business and engineering leaders. Their flagship event, the Alley Scholars Summit, brings together select students from colleges and universities with key professionals from across the country to participate in leadership development workshops and networking activities. It also hosts the Alley Scholars Shark Tank Challenge Business Plan, Elevator Pitch and other competitions, which focus on business plan development and social entrepreneurship, culminating in a presentation to venture capital judges. More than 3,000 students have attended the annual summit, and monetary awards have been made through the Shark Tank Challenge and Elevator Pitch Competition to support young minority entrepreneurship. The Historic St. James Missionary Baptist Church, located in Fayetteville, has been in existence for 153 years. Squire Jehagen, who was freed from slavery, became a Baptist preacher and later organized the church, which is built on the spiritual disciplines of prayer, worship, individual and corporate fasting, reading the Word daily, silence, solitude and doing the will of God. The pastors of The Historic St. James Missionary Baptist Church, along with the leadership and St. James family, have created spirit-filled programs to ensure the church’s growth and growth of the community. Programs consist of Christian Education, Music and Arts, Family Development (seniors, women, men, singles and married), Youth Development, Media, Outreach and Evangelism, and Fellowship and Hospitality. In addition to Youth Development, every high school graduate in the congregation who attends a college or trade school receives a scholarship to assist them in their educational endeavors. In 1920, The Historic St. James membership numbered 40, but today it surpasses 1,100. Curtiss P. Smith, the church’s current pastor, has been serving the church since 2007. Saint James United Methodist Church began in 1861 as Kitchen Chapel, where slaves gathered to carry out worship services, burial rites, marriages and baptisms. The church hosted the first kindergarten for black children and served as the meeting place for groups involved in social and political struggles throughout our nation’s history. The Saint James Church family was active in the civil rights struggle and helped smooth the way for school integration in Fayetteville in 1954. In the 1960s, the Saint James Men’s Choir ministered across racial lines by performing in other churches, campgrounds, the V.A. Hospital and other places that were open to the musical teachings of Christ. With the merger of the Methodist Church at the national level in 1969, Saint James expanded its family ethnically, and it evolved into the diverse family it is today. In 1969, the church welcomed Lewis Chesser as its first white pastor. Under the current leadership of Pastor Jeffery L. Blassingame, it still serves as a meeting place for social clubs and fraternities and offers worship, ministry and service to the Northwest Arkansas community. In addition to serving the immediate neighborhood, Saint James has also produced elected officials and civic leaders to serve the greater Fayetteville community.